Are High-Poverty Schools Educating the Poor to Remain so? Each year, many of the 15 million students enrolled in public secondary schools ask the same question: What's the point of staying in school if the choices are a minimum-wage job upon graduation or a minimum-wage job now? These students have astutely recognized a pitiful paradigm for far too many students enrolled in public education institutions. "Education is the key to success," proclaims the marketing of myriad organizations, companies and institutions. Yet, even high school dropouts are smart enough to read between the lines. If "education" is the key to success, then thousands of public schools are not educating students, as many of them graduate with worthless diplomas and a marketing mantra that dissipates along with the music from Pomp and Circumstance. 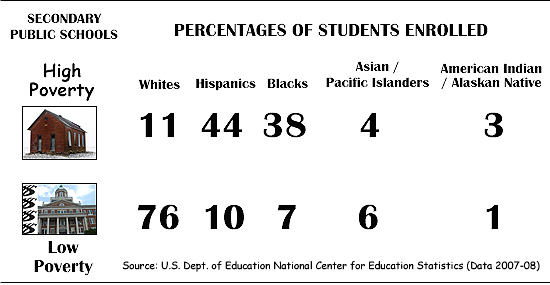 Stark data from the Department of Education, which governs the education of 50 million students, exposes the reality of public education and contradicts the public relations promotion. Over 16,000 public schools -- roughly 17 percent of all public schools -- are considered "high-poverty" educational institutions that service student bodies. What's more, 76 to 100 percent of these schools qualify for free or reduced-price meals (a family of four earning less than $41K annually qualifies for reduced-price meals; less than $29K qualifies for free meals). The numbers of high-poverty schools increased from 12 percent at the turn of the millennium to 17 percent in 2007-2008, according to the Department of Education. Of the total number of secondary schools, 9 percent are considered high-poverty (2,142 secondary schools) with enrollment of one million students. The vast majority of these schools, however, are considered part and parcel of the "dropout factories" spoken of by education leaders. There's a lot of justifiable concern over the dropout rates of high-poverty schools. But what happens to those high-performing dreamers who enthusiastically pursue academic achievement as a channel through which they might access economic opportunity? Numerous studies show that college-educated adults fare financially better than those with just high school diplomas. That would suggest Herculean efforts are ongoing toward ensuring high-poverty schools students have a chance to escape the clutches of their environments. Sadly, the vast majority of high-poverty high schools are churning out graduating classes that lack sufficient academic preparedness to enter college, much less succeed academically. 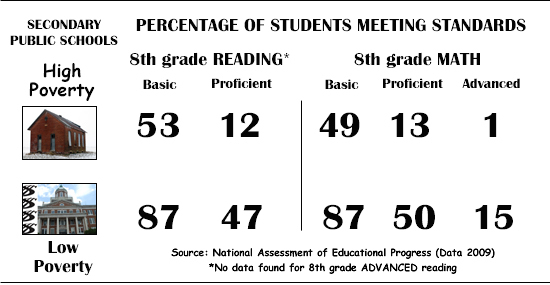 The paltry percentages of graduating students from high-poverty schools (68 percent) that move to the collegiate level (28 percent) disclose more about the broken system of academic preparation within those schools than the problem of keeping students from dropping out of them. By contrast, a more robust 91 percent of 12-graders graduate from schools considered "low-poverty," and 52 percent of graduates move on to the collegiate level. Either we are deliberately "educating" students within the walls of high-poverty high schools toward a life of poverty or we are not educating them at all. We cannot have it both ways. So, who are these students stuck in the dungeons of academic hell? They are who you might suspect: overwhelmingly, racial minorities. The data show that high-poverty schools significantly under-perform in academic comparison to low-poverty schools. To add insult to injury, low-poverty schools also display dismal academic success overall, albeit significantly higher than high-poverty schools. At the same time the schools are failing, the Innovation Economy, fueled by STEM education (science, technology, engineering and math), is speeding up and producing more jobs that require STEM-educated professionals. At the slothful pace of education reforms, racial minorities trapped in high-poverty schools are destined for over-representation in minimum-wage and service sector menial jobs. Some students, however, can be saved from having their dreams ambushed. STEM represents opportunity in the new Innovation Economy. And some schools and students are targeting a laser-like focus upon opportunity channels like the Level Playing Field Institute and its SMASH Academy (Summer Math and Science Honors). SMASH operates with the idea that financial roadblocks ought not be the obstacle that prevents enterprising hard-working talented minority youth from accessing academic opportunity. Selected students attend free five-week summer courses on the campuses of UC Berkeley and Stanford University over three consecutive summers. There are 80 for each campus in the most recent cohort of student scholars. With a focus on racial minorities, LPFI and SMASH Academy can serve as a gateway for students who seek to escape the confines of low expectations and lackluster support within their environments. 86 percent of students selected for the program are first-generation college-bound and 85 percent qualify for free or reduced meals. Back row L-R: Shantina Jackson (Asst. Director Education Programs for LPFI), Mitch Kapor (LPFI Board Member), Kevin Madrigal (SMASH scholar, starting Stanford in the fall - also Gates Millennium Scholar), Jose Villanueva (SMASH scholar, starting Stanford in the fall), Curtis Feeny, Dr. Rob Schwartz (Exec. Dir of LPFI). Front row L-R: Monica Alcazar (SMASH alumnae, current Stanford student), Freada Kapor Klein (LPFI founder), Christina Feeny (SMASH Co-founder), Megan Gage (SMASH scholar, starting Stanford in the fall), Dr. Jarvis Sulcer (Director of Education Programs at LPFI). Fortunately, we don't have to wait for a government-funded public education system to get its act together. There are enough high net worth individuals, investors, athletes, entertainers, musicians and STEM field professionals who are concerned about the future of our kids to make a tremendous difference by supporting intervention programs like SMASH and others around the country. 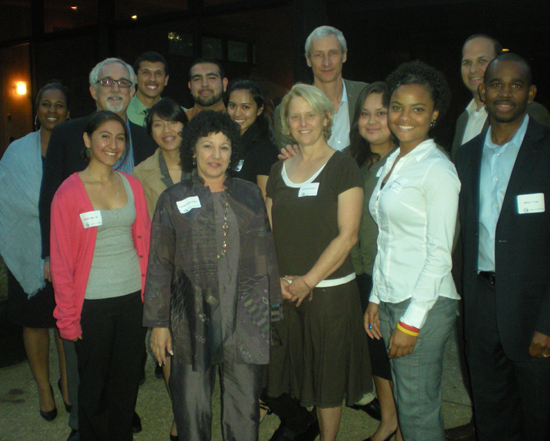 Investments in the next generations are being made daily by concerned individuals, like Mitchell Kapor and Freada Kapor Klein, who produce access channels to higher education for low-income, high-achieving students of color. Today, there are many public school students enduring troubled crime-ridden communities and school campuses while they focus on academic excellence within failing educational institutions. These students need help now. They don't have the luxury of time. Education is clearly their key to success. But will they have access to STEM education programs that provide a pathway for them to pursue their dreams? The solution to that equation depends upon you and me.